I don't know. Maybe I jinxed myself. 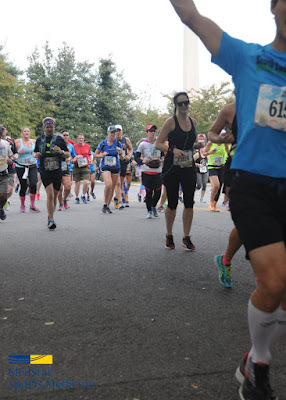 But I can tell you exactly why I posted about my marathon PR bid last week: I thought for sure it was going to happen. Oh, no question. Hadn't I trained better and harder? Hadn't I carefully avoided injury? Hadn't my 20 miler gone a million times better? Hadn't I set myself for pre-race success, with several days of sports drinks and multiple alarms and a determination to run the whole bridge? I mean, last year was a laughable comedy of errors! This year HAD to be my year! CLIF STILL HAD THE 4:45 PACE BANDS FOR ONCE! Was that not a sign??? It all started off auspiciously enough: Metro being what it was, Pat's boss (who was also running) offered to drive me to one of the shuttle pickup spots in exchange for my navigation assistance. I woke up on time. He met me on time. The shuttle line was loooooong, but I still made it to the start line with a good hour to spare. I lined up where I belonged. I waited patiently. And when I started... I was slow. Like, National Capital 20 Miler slow. Trail slow. Like, at the start of the race I should be reining myself in and still about a minute faster out of adrenaline why the hell am I going so slow. I didn't feel bad - no pains or fatigue - I just had no snap. No crackle. NO POP AT ALL. And that could probably describe the first, say, 17 miles of the race. There were bright spots of course, like running through Georgetown where a band was playing Billy Joel's song about being a lunatic, which I enjoyed; and the spectators are always great. I met up with Pat on the mall and that cheered me up considerably. But I was clocking snail miles. Quick interlude because I don't know where else to put it: I saw like six dead rats on the course, squashed as roadkill. Which is odd seeing as how the roads are closed prior to the race. Did someone bring a box of dead rats and toss them as every few miles as they ran? Anyway. I came to my traditional sticking point: the 14th St bridge that must be beaten or be swept! This long monstrosity had slowed me to a walk two years in a row, but this year I was determined. No more. I was going to run it. Barring water stops, I was going to run this whole marathon! And I conquered that bridge. I ran it as planned. I stared in the face of every incline and refused to blink. It might have been a bad idea. At this point in the race, three things started to happen. The first to set in was a new one for me: dehydration. Temperatures were very VERY unseasonably warm for DC - the high for the day was 78. And as the sun rose in the sky, so did my thirst. I was taking a Gatorade and two waters at every water stop and wanting more a half mile later. I even took a mini cup of beer from a spectator, which is not usually the sort of thing I want during the race but at that point I was ready to accept just about any cold liquid. The second problem to hit was my GPS watch. Despite its previous battery track record of making it upward of 5:30 (albeit on its last legs), it died on me at about the 4:15 mark. Now I had no feedback regarding my times, be they per mile or overall. These things were not helpful. But even less helpful was my body. Sure, I was experiencing the standard discomfort that comes with running a marathon, including foot soreness and a touch of stiffness. I expect that, though. I can power through that. The real issue was, quite suddenly and sincerely, the base of my spine; or, to be more specific but self-diagnosing, I believe it was where the base of my spine meets my pelvis. For no foreseeable reason, it decided to start hurting. So I did the unthinkable but ultimately, probably, the wise thing: I stopped and walked a bit. But this wasn't how I wanted it to go down, so I tried to do some intervals. As soon as I started running, there it was - SPINE PAIN. It felt like it desperately needed to be cracked but couldn't, instead sticking me with not a stabbing pain but a definite, disconcerting twinge. I would run a couple steps, then stop and walk again. Luckily I only had like a mile and half left at this point, but it was not good for my morale, especially since I had no idea how long I had been running (thanks, GPS battery). I did know Pat was waiting for me just beyond the tunnel before the finish, and leading me to him was a beautiful downhill section. I tightened my core, leaned slightly in the direction that lessened my spine discomfort, and started running again. Luckily this loosened me up a bit, and after a quick cheer-up kiss from Pat I headed for the finish, even managing to run up that awful hill. As I came upon the finish the announcer said my name, which was nice, and after a quick high-five from the Marine Corps bulldog mascots I passed under the wire. I was allowed to download this specific image for free. Only this one. Gee, thanks. I was okay. It was okay. Except that it wasn't. It wasn't the race I had wanted at all. A very nice Marine put my medal around my neck and asked me how I felt. "Like I could've done better," I said like the ingrate I am, and he kindly comforted me with the fact that I was finished and also not dead or broken, which is true. Hey, no matter what I ran a marathon, right? Pat made this same point. And to be honest, I wasn't disappointed in myself. I hadn't made any huge mistakes. I hadn't done anything overly dumb. I had trained hard and tried hard. No, I wasn't disappointed with myself. But I was generally disappointed. I didn't cry or anything, but I couldn't quite keep the wobble out of my voice as I described my experience to him. I was so sure it was going to be my day and here I was, SLOWER than I had been in my past two outings. Here's the thing, though. As it turns out, I wasn't actually as behind as I thought I was - only about 40 seconds slower than my previous neck-and-neck times. If my GPS hadn't failed and I had known that, I might've pushed myself. I might've shaved at least a few second off my time after all. On the other hand, though, had I pushed, would that have escalated my spine issue into a more permanent problem? I don't know. I'm not sure what went wrong, to be honest. It might've been the warm weather, leading to my subsequent hydration problems. Maybe I didn't taper enough. Maybe I have a low-level cold. No idea what's up with my spine, although thankfully it hasn't given me any post-race trouble worth noting. All I know is that I thought that I had this PR in the bag, and I whiffed it, and I'm sad. You know what makes me happy, though? Walt Disney World! And you know who's headed to Walt Disney World? ME! This Saturday! For the Wine & Dine Half Marathon! Which may or may not be terrible due to having run a marathon just a week prior but whatever because DISNEY! And in other news, I'm in the market for a new GPS watch. 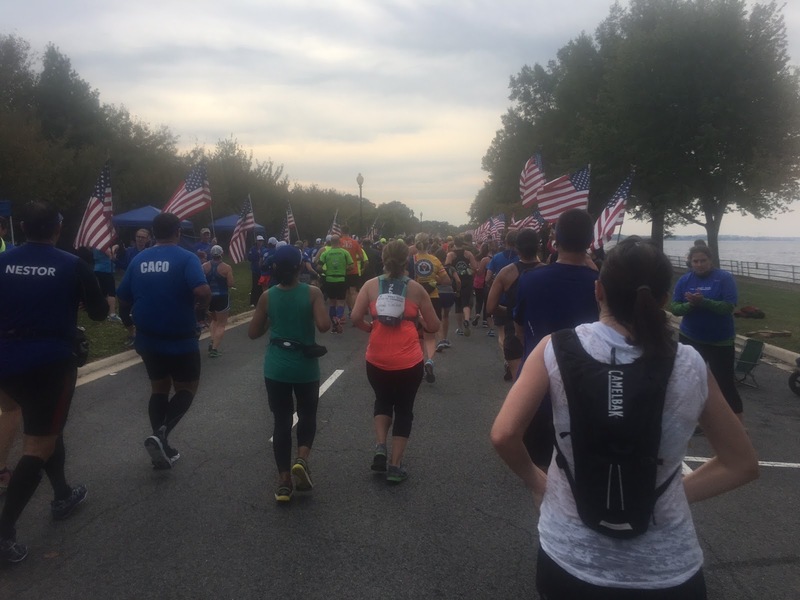 Did you run the Marine Corps Marathon? How did your race go? Pat says his boss said he had a bad race too, but maybe yours was better? Tell me your hydration secrets!